Ipilimumab was available upon physician request for patients aged 16 or over with pretreated stage III (unresectable)/IV melanoma, for whom no other therapeutic option was available. Patients received ipilimumab 3 mg/kg every 3 weeks for four doses. Patients with stable disease or an objective response to ipilimumab were eligible for retreatment upon disease progression. Tumour assessments were conducted at baseline and week 12. Patients were monitored for adverse events (AEs) within 3 to 4 days of each scheduled visit. Of 855 patients participating in the EAP in Italy, 833 were evaluable for response. Of these, 13% had an objective immune response, and the immune-related disease control rate was 34%. Median progression-free survival and overall survival were 3.7 and 7.2 months, respectively. Efficacy was independent of BRAF and NRAS mutational status. Overall, 33% of patients reported an immune-related AE (irAE). The frequency of irAEs was not associated with response to ipilimumab. Outside of a clinical trial setting, ipilimumab is a feasible treatment option in patients with pretreated metastatic melanoma, regardless of BRAF and NRAS mutational status. Data from this large cohort of patients support clinical trial evidence that ipilimumab can induce durable disease control and long-term survival in patients who have failed to respond to prior treatment. Ipilimumab is a monoclonal antibody that blocks cytotoxic T-lymphocyte-associated antigen-4 (CTLA-4), a negative regulator of T-cell activation, thereby augmenting proliferation and infiltration into tumours, leading to tumour cell death . In the European Union, ipilimumab 3 mg/kg is indicated for adult patients with advanced (unresectable or metastatic) melanoma. In randomised phase III trials, ipilimumab resulted in an overall survival (OS) benefit relative to control in both pretreated and treatment-naïve patients [2, 3]. Additionally, long-term survival was observed with ipilimumab alone or in combination with other agents in phase II trials, with 5-year survival rates ranging from 13% to 36% [4–6]. Melanoma is associated with oncogenic mutations that activate the mitogen-activated protein kinase-signalling pathway, resulting in accelerated cell-cycle progression and enhanced proliferation . Mutations in the genes encoding the protein kinases BRAF and NRAS are found in around 40% to 50%, and 20% of patients with cutaneous melanoma, respectively [8–10]. Agents approved to treat these subpopulations include the BRAF inhibitors vemurafenib and dabrafenib, and the MEK inhibitor trametinib, which are indicated for adult patients with BRAFV600 mutation-positive advanced melanoma [11–13]. Other inhibitors of mutated MEK and/or NRAS are in advanced clinical development . However, responses to these agents may be short-lived due to the development of resistance and there is still a need to explore new therapeutic options . Because ipilimumab targets the tumour indirectly, its mechanism of action is independent of kinase-signalling pathways. A retrospective analysis of data from a phase II trial showed that responses to ipilimumab were independent of BRAFV600E mutation status, with 30% to 35% of all patients achieving disease control . The immune-mediated mechanism of action results in immune-related adverse events (irAEs), caused by increased or excessive immune activity . A relationship between irAE occurrence and response to ipilimumab was initially proposed following phase II data suggesting a link with longer survival [17–19]. However, these data were inconclusive, and disease control and survival benefits have also been observed in patients not experiencing irAEs [19, 20]. Here we describe the safety and efficacy of ipilimumab 3 mg/kg in patients enrolled in an expanded access programme (EAP) in Italy. The EAP provided an opportunity to assess ipilimumab 3 mg/kg in a large cohort of advanced melanoma patients outside of a clinical trial setting (who had no other therapeutic options), with evaluation of the correlation between BRAF and NRAS mutation status and clinical benefit , and the potential relationship between efficacy and irAE development . Details of the EAP study in Italy are also reported elsewhere [23, 24]. Adult patients, aged 16 or over, with unresectable stage III/IV cutaneous, ocular or mucosal melanoma were eligible if they had previously failed or were intolerant to ≥1 systemic therapy, had an Eastern Cooperative Oncology Group (ECOG) performance status (PS) of 0 to 2, and no other therapeutic option. Previous systemic treatment should have been completed ≥28 days before receiving ipilimumab. Previous treatment with an anti-CTLA-4 antibody was allowed unless prior use was discontinued for lack of clinical benefit or an AE. Patients with asymptomatic brain metastases at baseline were eligible. Patients received intravenous ipilimumab 3 mg/kg every 3 weeks for a total of four doses. In the absence of dose-limiting toxicities, patients with a stable PS received all four doses. Dose reduction or modification was not allowed, but dose omission or discontinuation was recommended when necessary. Patients with disease progression following stable disease (SD) of ≥3 months’ duration or an initial objective response (partial or complete) were eligible for retreatment with ipilimumab 3 mg/kg every 3 weeks for four doses. The study has been conducted in accordance with all stipulations of the protocol and in accordance with Good Clinical Practices, local regulatory requirements (approved by a local Independent Ethics Committee) and the Declaration of Helsinki. Tumour assessments were conducted at baseline and after completion of treatment (week 12) according to immune-related response criteria (irRC) . Responses were classified as immune-related complete response (irCR), immune-related partial response (irPR), immune-related SD (irSD) or immune-related progressive disease (irPD). Clinical benefit was represented by immune-related best overall response rate (irBORR; irCR or irPR) and disease control rate (irDCR: percentage of patients achieving irCR, irPR or irSD). BRAF and NRAS mutation status was collected retrospectively, where possible. AEs were monitored and assessed in all patients who received ipilimumab and graded according to the National Cancer Institute Common Terminology Criteria for Adverse Events (version 3). AEs were managed using protocol-specific guidelines. All AEs, regardless of drug attribution, were recorded from the first dose of ipilimumab until 70 days after treatment discontinuation. Patient and disease characteristics were analysed using descriptive statistics, and expressed as relative frequency (percentage) for discrete variables or median for continuous variables. Progression-free survival (PFS) and OS were estimated using Kaplan–Meier analysis and expressed as medians with corresponding two-sided 95% confidence intervals (CIs). Differences between curves were evaluated using the log-rank test. Between June 2010 and January 2012, 855 patients with cutaneous (n = 631), mucosal (n = 71), and ocular (n = 83) melanoma were treated with ipilimumab 3 mg/kg at one of 55 Italian centres in the EAP. Baseline characteristics are provided in Table 1. Most patients had an ECOG PS of 0 or 1, with only 25 patients (3%) having a PS of 2. At baseline, 17% had brain metastases and 40% had liver metastases. As per protocol, all patients had received prior systemic therapy, with 125 (15%) receiving three or more prior therapies. Although chemotherapy was the most frequently used previous treatment, 192 patients (22%) received prior immunotherapy with interferon and 59 patients (7%) had been treated with a BRAF inhibitor. Of 469 patients with tissue samples for retrospective testing of the BRAF mutation, 173 (37%) were positive. Fourteen of 82 patients (17%) tested for the NRAS mutation were positive, including three patients who also had a BRAF mutation. ECOG PS: Eastern Cooperative Oncology Group performance status; LDH: lactate dehydrogenase; ULN: upper limit of normal. With a median follow-up of 6.7 months (range, 0.5–34 months), the irBORR was 13%, comprising 29 patients (3%) with an irCR and 82 (10%) with an irPR at any time. Twenty-two patients were not evaluable for response for treatment refusal (n = 4), loss to follow-up (n = 7), treatment-related toxicity (n = 3), deterioration without progression (n = 3) or unknown reasons (n = 5). Of 833 evaluable patients, 175 (21%) had irSD, for an irDCR of 34%. The median duration of disease control was 13.1 months (95% CI, 11.1–15.0). Patients with BRAF-mutation positive tumours and BRAF wildtype tumours had comparable irDCRs (38% vs 39%), as did patients with or without NRAS mutations (57% vs 49%) (Table 2). irRC: immune-related response criteria; irAE: immune-related adverse event; irCR: immune-related complete response; irPR: immune-related partial response; irSD: immune-related stable disease; irPD: immune-related progressive disease; irDCR: immune-related disease control rate. Of 855 treated patients, 51 (6%) were retreated with ipilimumab 3 mg/kg upon disease progression, including 12 patients with a BRAF mutation and two with an NRAS mutation. Of these 51 patients, the best response to induction therapy was an irCR or irPR in 20 patients and irSD lasting ≥3 months in 31 patients. Upon retreatment, the irDCR was 55%. Of the 12 patients with a BRAF mutation, two had an irCR, two had an irPR and four had irSD upon retreatment for an irDCR of 67%. Both NRAS-mutated patients had irPD upon retreatment. As of December 2012, median PFS among all treated patients was 3.7 months (95% CI, 3.4–4.0; Figure 1A), and median OS was 7.2 months (95% CI, 6.4–8.0; Figure 1B). Survival curves were comparable between patients with and without mutations in BRAF or NRAS (Figure 1C) and Figure 1D). 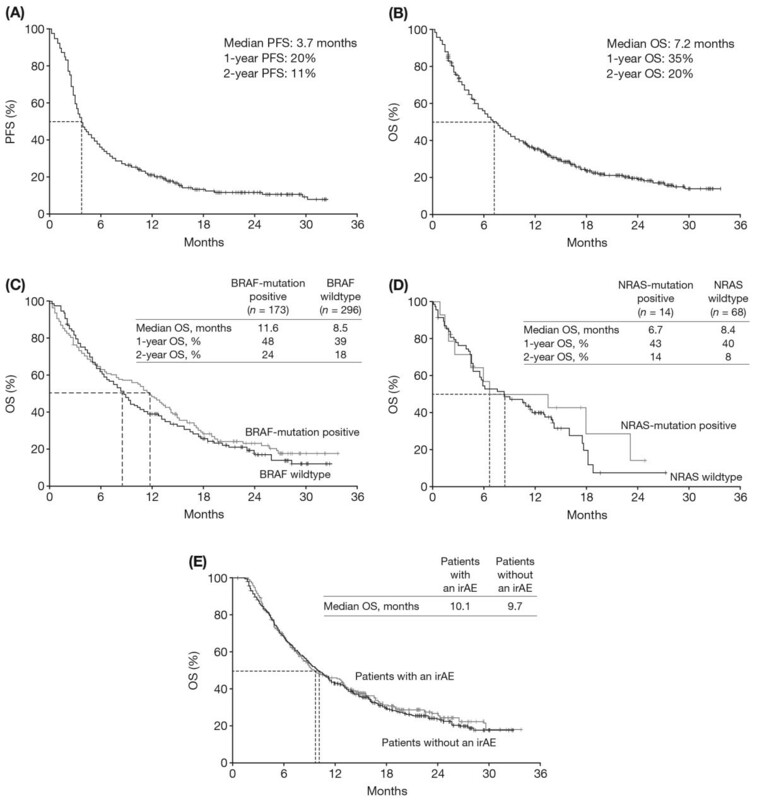 For patients with a BRAF mutation, median OS was 11.6 months (95% CI, 9.6–13.6) versus 8.5 months (95% CI, 7.4–9.6) for patients with wildtype BRAF. Similarly, median OS for patients with an NRAS mutation was 6.7 months (95% CI, 0–20.8) versus 8.4 months (95% CI, 3.9–12.8) for patients with wildtype NRAS. One and 2-year OS rates, as of December 2012, are presented in Figure 1. Kaplan–Meier curves for PFS and OS. PFS for all patients (A). OS for all patients (B). OS for BRAF-mutation positive (n = 173) and BRAF wildtype (n = 296) patients (C). OS for NRAS-mutation positive (n = 14) and NRAS wildtype (n = 68) patients (D). OS in patients with or without an irAE (any grade) in patients with who received three or four cycles of ipilimumab (E). PFS: progression-free survival; OS: overall survival; irAE: immune-related adverse event. Among all treated patients, 399 (47%) reported an AE (any grade), with grade 3/4 AEs in 100 patients (12%). AEs were generally reversible with treatment as per protocol-specific guidelines; 25 patients discontinued ipilimumab due to toxicity. AEs leading to discontinuation included diarrhoea (n = 7), rash (n = 2), liver dysfunction (n = 1), thrombocytopenia (n = 1), pain (n = 1) and vasculitis (n = 1). Five deaths were considered to be related to treatment (one patient each with tumour lysis syndrome, hypothermia, bone marrow aplasia, hepatitis and acute renal failure). For sites treating 1 to 10, 11 to 30, and over 30 patients, rates of hospitalisation for serious AEs were 9%, 5%, and 3%, respectively. The safety profile of ipilimumab was consistent regardless of BRAF and NRAS mutation status. AEs were considered to be immune-related in 286 patients (33%) (Table 3), with a median time to onset of 5 weeks (range, 1–13 weeks). Baseline patient characteristics were similar for patients with or without irAEs. Most irAEs were low grade, with grade 3/4 irAEs in 55 patients (6%; most commonly diarrhoea, liver toxicity and fatigue/asthenia). Median time to resolution was 1.7 weeks (range, 0.1–11.1 weeks) for irAEs of any grade and 1.1 weeks (range, 0.1–3.4 weeks) for grade 3/4 irAEs. Patients who were unable to complete at least three doses of ipilimumab (n = 194) had a lower incidence of irAEs (22%) than those who received three or more doses of ipilimumab (n = 661; 37% had irAEs), reflecting the onset of some irAEs beyond initial dosing. The irDCRs for patients with or without an irAE of any grade were 35% and 34%, respectively (Table 2). Among the 278 patients with an irAE who were evaluable for response, 10 (4%) had an irCR, 31 (11%) an irPR and 57 (21%) irSD. For these patients, median duration of disease control was 11.7 months (95% CI, 9.9–13.5). Respective numbers for the 555 evaluable patients without an irAE were 19 (3%), 51 (9%) and 118 (21%), with a median duration of disease control of 13.6 months (95% CI, 11.1–6.0). After adjusting for the number of doses completed, median OS for patients who had an irAE was 10.1 months (95% CI, 8.9–11.3), compared with 9.7 months (95% CI, 7.1–12.3) for those who did not (Figure 1E). Ipilimumab improved survival in phase III trials of both pretreated and treatment-naïve patients with metastatic melanoma [2, 3]. To date, over 17,000 patients have been treated with ipilimumab, either commercially or through clinical trials or EAPs, establishing immune-oncology as one of the four pillars of anticancer treatment . In the EAP, patients with no other therapeutic options, who were ineligible for clinical trials, received ipilimumab at its licensed dose, providing an opportunity to assess efficacy and safety in a large cohort of patients outside the trial setting. Disease control and survival data for more than 850 pretreated patients with metastatic melanoma were consistent with clinical trial data. In the EAP in Italy, one third of patients achieved disease control at any time according to irRC, consistent with patients who received ipilimumab 3 mg/kg in the phase III registrational trial which used modified World Health Organization (WHO) criteria to evaluate bi-dimensionally measurable lesions . Encouragingly, among 51 patients retreated with ipilimumab, 55% regained disease control, suggesting that restimulating an immune response may be an option for patients progressing after an initial response to treatment . Responses and/or SD with ipilimumab can be durable, with PRs of 56 to 71+ months and CRs of 62 to 99+ months reported in phase II clinical trials . Furthermore, clinical trial data consistently show a plateau in survival curves after 2 to 3 years, with approximately one fifth of patients having long-term survival, as confirmed with 10 years’ follow-up for some patients [4, 5, 28, 29]. In preliminary landmark analyses from the EAP, an estimated 20% of patients were still alive at least 2 years after starting ipilimumab, suggesting these patients may also have additional life-expectancy. Extended follow-up would be required to confirm this. Unlike vemurafenib, which is restricted to patients with the BRAFV600 mutation, ipilimumab can be used regardless of mutational status. In a previous study, DCRs were comparable between patients with BRAFV600E-mutated melanoma and those with wildtype tumours , and EAP data support this. In the EAP, both the irDCR and median OS appeared independent of BRAF and NRAS status. Ipilimumab, therefore, provides clinical benefit to patients with the BRAFV600 mutation, suggesting that optimal sequencing of ipilimumab and vemurafenib for BRAF-mutated metastatic melanoma should be investigated further as it may be beneficial to use ipilimumab earlier in the disease course. Despite reproducible evidence of long-term clinical benefit with ipilimumab, some physicians are wary of the perceived severity and novelty of AEs resulting from increased or excessive immune activity. In the EAP in Italy, approximately one third of patients experienced an irAE of any grade, which were predominantly mild. A possible negative correlation between the number of patients treated at a site and the proportion experiencing serious AEs was observed, and AEs tended to resolve quicker than in clinical trials. In the registrational phase III trial of ipilimumab, median time to resolution of grade 3/4 immune-related AEs was 7.7 weeks (95% CI, 3.0–not reached) , compared with just 1.1 weeks (range, 0.1–3.4) in the EAP. These preliminary data suggest that as physicians gain more experience of treating patients with ipilimumab, they are more familiar with its associated AEs, enabling earlier detection and timely intervention. Recognition that managing AEs associated with ipilimumab is different, but no more difficult, than for AEs associated with non-immune agents may lead to increased confidence in ipilimumab use. There appeared to be no obvious differences in the baseline characteristics of patients with and without an irAE. Because ipilimumab can break peripheral immune tolerance, there may be a relationship between irAEs and response to ipilimumab [1, 18]. However, in the EAP, immune-related disease control and survival were comparable in patients with and without an irAE, suggesting that patients without an irAE of any grade can still benefit from ipilimumab as supported by previous data [19, 20]. Continued vigilance and early intervention are recommended to address any symptoms and prevent potentially serious complications. Because irAEs can be severe or life-threatening, ipilimumab should be used with caution in patients with a history of autoimmune disease, and is contraindicated if the disease is active and severe. This was an analysis of retrospective data from an EAP that was not designed to compare efficacy outcomes between patient subgroups, and used immune-related rather than WHO response criteria; therefore the results must be interpreted accordingly. Results from Italian centres may have also been influenced by national patient management trends. Nevertheless, the EAP provided an important opportunity to assess ipilimumab 3 mg/kg in a large cohort and a situation closely resembling daily clinical practice. Ipilimumab was generally well-tolerated, and efficacy did not appear related to irAE occurrence. The results suggest that ipilimumab is an effective and safe treatment for pretreated patients with metastatic melanoma regardless of BRAF and NRAS mutation status. Future research should focus on assessing the longer-term, real-life outcomes of ipilimumab therapy and increasing the number of patients who benefit through improved patient selection and timely intervention. All participating patients provided signed informed consent for administration of the drug, academic evaluation of clinical outcomes and publications or reports related to the compassionate use programme before enrolment. For patients below the legal age, consent from parents, guardians, or next of kin has been provided. The authors would like to thank the patients and investigators who participated in the European EAP. The EAP was sponsored by BMS. Editorial and writing assistance was provided by Fiona Bolland (StemScientific, Cheshire, United Kingdom), funded by BMS. Statistical support was provided by Clinical Research Services, funded by BMS. This study was funded by BMS. The sponsor had no role in data collection, data analysis, data interpretation, or writing of the report. All authors had final responsibility for the decision to submit for publication. Paolo A. Ascierto has served in a consultancy/advisory role for Bristol-Myers Squibb (BMS), Merck Sharp & Dohme, Roche-Genentech, GlaxoSmithKline (GSK), Amgen and Celgene; he has also received research funding from BMS, and honoraria from BMS, Merck Sharp & Dohme, Roche-Genentech and GSK. Vanna Chiarion Sileni has served as a consultant and in an advisory role for BMS, GSK and Roche-Genentech, and has received support to attend meetings from BMS and GSK. Michele Maio has had an advisory role and received funding for communication programmes from BMS, Roche-Genentech and Merck Sharp & Dohme and has received research funding from BMS. Michele Del Vecchio has served as a consultant or in an advisory role for Roche-Genentech and GSK and has received research funding from Roche-Genentech, GSK, Celgene and BMS. Paolo Marchetti has served as a consultant or in an advisory role for BMS, GSK, Novartis, and Roche-Genentech. Alessandro Testori has served as a consultant or in an advisory role for, and received honoraria from, BMS, Roche-Genentech, GSK, Amgen, Merck Sharp & Dohme and IGEA, and travel expenses from IGEA and Oncovision. Paola Queirolo has served as a consultant and in an advisory role for BMS, GSK and Roche-Genentech. None of the remaining authors have any competing interests to disclose. PAA, MM, VCS, and PQ devised the study concept. PAA, MM, and PQ were involved in designing the study and statistical analysis. All authors were responsible for the data acquisition, quality control of data and algorithms, and data analysis and interpretation. All authors contributed to the preparation, editing, and review of this manuscript. All authors read and approved the final manuscript.